For every wacky face Cara Delevingne makes, she makes a fierce modeling face as well. We saw a mix of these at the DKNY photoshoot she had with fellow models Jourdan Dunn and Eliza Cummings in NYC’s Times Square yesterday. Cara was definitely on model mode, but the youthful vibe of her DKNY clothes let some of her fun personality to peek through. We mean it’s pretty difficult to be 100% serious when you’re wearing crazy patch-covered jeans like the pair Cara wore for the shoot. The jeans looked even more fun the way Cara styled them after the photoshoot, that is, with a neoprene stadium jacket and neon-colored sneakers. Cara Delevingne’s jeans are no doubt customized for the photoshoot, but it’s easy — not to mention fun — to get the look! Making your own patch-covered jeans would make for a cool DIY project; collecting the patches alone is already an interesting process. However, the above jeans cost a staggering $695. 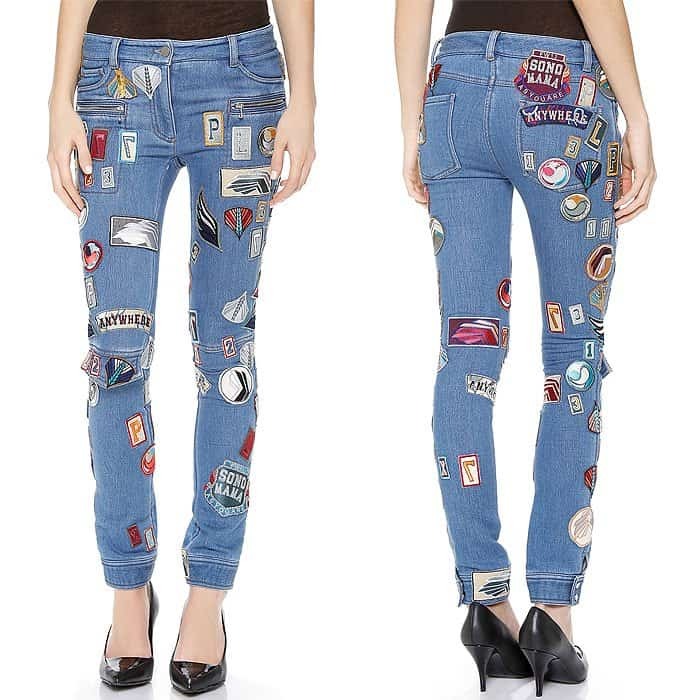 We still say go for the DIY, and grab a pair of DKNY jeans at Amazon to serve as your canvas.